That is a 12% increase between November 2016 and November this year! And I once caught a fish once this big. The months of inventory is still low, creating a classic supply and demand type of scenario. One month’s worth of inventory it’s still crazy low! 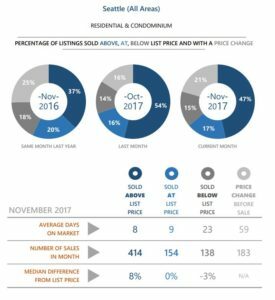 42 percent of all closings in November 2017 sold above the list price! 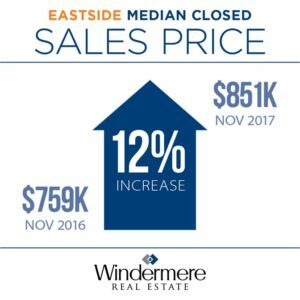 In fact, the average price between the list price and the sold price was 5% of all the closed sales on the eastside and South Bellevue. 63.2% of all Eastside listings sold within 15 days or less! Now don’t be misled…. It’s not just a matter of putting a sign in the yard and getting it sold there’s a lot more to it. 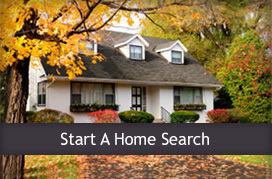 It’s the presentation, and the marketing of your home and the negotiating skills of the realtor listing that home! We are still in a seller’s market! 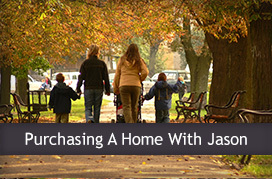 But what about buyers Jason Cook? Well, if you’re a buyer and you have waited a year it has cost you a lot of money. 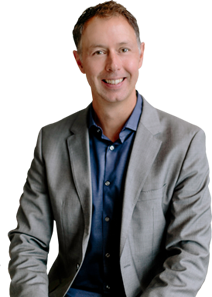 Basically, the purchase price has gone from $750,000.00 up to $850,000.00, coupled with an increase in interest rates, the have also increased during that same time. Last month they were at 3.9% so if you waited between November last year and November this year that costs you nearly $500 a month in your mortgage. Now interest rates have actually gone up since last month and in fact right now in December we’re looking at four and a quarter.